Alberto Benbunan is the cofounder of Mobile Dreams Factory. 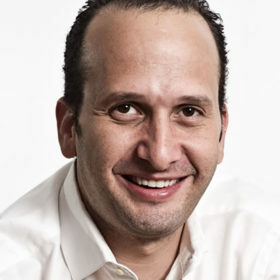 After founding his first company in 1994 at the age of 18, Alberto went on to found several successful start-ups in Latin America including Ticketron Venezuela, Webtron, Promotron and TuCupon.com. Alberto moved to Europe in 2002 to work in business development at Excem Technologies and later at Marca, the most widely-read newspaper in Spain. In 2004 and together with Salvador Carrillo, Alberto founded Mobile Dreams Factory, one of Europe’s leading mobile marketing and advertising agencies. According to MMA Global, Mobile Dreams Factory is one of the most decorated mobile marketing firms, having earned international awards from Cannes Lions, Eurobest, MMA Awards, El Sol, and more. Alberto is still the active Chairman of Mobile Dreams Factory today, which now focuses primarily on mobile consulting services. Through MDF, the team has founded Mediasmart, a mobile performance-based DSP, and Moviplans, marketplace management service provider for audience owners who monetizes their audience and maximizes their revenues, in 2012. Moviplans was sold Grupo DIA in 2015. After selling Moviplans, Alberto shifted his focus to a new passion in food, FMCG, and RetailTech. In the past two years he has cofounded three different companies: Gelt (www.geltapp.com), DelSúper (www.DelSuper.es), and Super Robotics (now in stealth mode). Alberto has been a professor of emerging media and mobile marketing at IE Business School since 2008. He regularly mentors for incubators and accelerators, is an active angel investor, and participates in various non-profit organizations in Europe and Israel.